For many Little Village residents, Reverend Jose Landaverde is a leader, a hero, and friend. In the eyes of legislators he is a formidable opponent. Growing up in a time when civil war erupted in his native El Salvador, Landaverde joined the Farabundo Martí National Liberation Front, a guerilla organization, where he acquired a unique view on social justice and how to go about obtaining radical change. 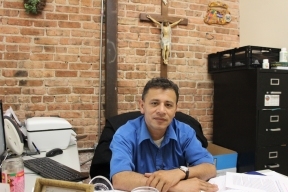 Since 2007, Landaverde has advocated for the rights of the immigrant community, including the obtainment of driver’s licenses for the undocumented, pushed for more resources for single-parent homes, and urged proprietors to invest their money back into the community of Little Village instead of the suburbs. Most notable, Landaverde along with various members of his church, staged a series of hunger strikes in the past few years to raise awareness over undocumented individuals needing an organ transplant. Landaverde aggressively pushed for legislators and representatives of various hospitals across the city to meet with him and church members to devise a plan to help the undocumented. “It has been stressful these past years,” exclaimed Landaverde. Due to his antics, Landaverde, hesitantly, decided to retire next month after 25 years of service, after falling ill as a result of the hunger strikes and endless hours of advocacy. Three years ago, Landaverde was diagnosed with diabetes. Today, Landaverde has suffered from a series of health problems such as, ulcers and symptoms resembling a stroke. “It is sad to admit, but I have physical limitations. I cannot do what I once did a year ago. My body cannot handle it anymore. So I have come to the decision to step down and allow new leadership to come in and take Our Lady of Guadalupe Mission to the next level,” said Landaverde. Landaverde is currently in the process of seeking a new leader to run Our Lady of Guadalupe Mission, but has admitted it has not been easy. He will continue to work alongside community members after he addresses his health issues.